The College with 70 years of standing is the first and the only NAAC Accredited Government institution to be accorded “A” Grade. Besides great concern for equity and accessibility, the College has deep commitment toquality. Setting benchmarks for continuous quality, sustenance and improvement, the College has walked many a miles. During the course of its journey, the Arts College has started many new programmes like B.Com, and BBM in the UG Section besides M.A (Economics), M.A (Political Science) and the Post-graduate MBA programme. It has also started Add-on Courses in Communicative English and Financial Services. The College was rechristened as “Maharani’s Arts, Commerce and Management College for Women” in the subsequent times. With many innovative programmes, value-addition initiatives and women empowerment strategies, the College has earned social accreditation and carved a niche for itself not only in Bangalore City but in the whole state of Karnataka. This institution which has always strived to empower women students by providing knowledge, skills and the value system that are necessary to create worthy human beings. The College has the necessary infrastructure to facilitate meaningful teaching-learning. It has a resourceful library with 60,000 books, 04 computer laboratories, playground, LCDs, OHPs and other audio-visual aids that promote learning in an institution. Highly qualified and motivated faculty leave no stone unturned to achieve an excellent academic environment in the institution. The College has received great support from the Government, Department of Collegiate Education, CDC, alumni and philanthropists from time to time. The College is on the verge of Reaccreditation process and intends to achieve many more milestones. The College is affiliated to Bangalore University and offers B.A, B.COM and BBM Courses. The three year course is offered in 6 semesters. 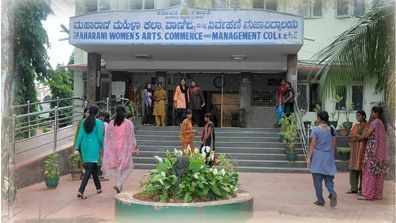 Students can choose either English or Kannada as medium of Instruction for B.A, whereas B.COM and BBM are offered only in English Medium, Constitution of India, Environmental Science and Computer Fundamentals are the compulsary papers for all students in different semesters. Part I: Students have to choose one language from Kannada, Hindi, Telegu , Tamil, Sanskrit and Urdu along with English. BBM students must wear the prescribed uniform twice a week and as and when instructed by the college. It is mandatory for all BBM students to prepare a project report after the completion of the project. Viva-voce exam will be conducted by the Bangalore University. The Industrial visit is compulsary. Campus recruitment will be provided.